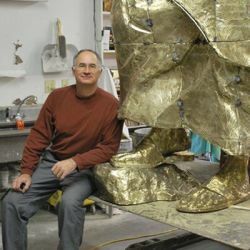 Goldy Gopher is a bronze and granite sculpture created by Nicholas Legeros in 2013. It stands outside of Coffman Student Union, University of Minnesota and welcome students and staff. It is an immortalization of the mascot for the University of Minnesota-Twin Cities campus and the associated sports teams.